of St. Mary's founding, October 1978. The Church of St. Mary's came into existence in 1928. It was founded by a group of families who had been parishioners of the Church of St. John of Damascus. This energetic group of families banded together to further the growth of the Orthodox Faith. These faithful and courageous individuals formed and organized the Antiochian Society of St. Mary's Church, constituted by the Commonwealth of Massachusetts. 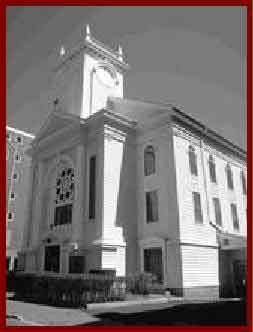 The first assemblage of the founders was held at the Greek Orthodox Church on Union Park Street, Boston. It was learned that the City of Boston had recently closed a school building at 119 Hudson Street, Boston, and that the city was seeking a buyer. Arrangements were made shortly thereafter to purchase the building, and to renovate the structure to serve as a Church. The name of St. Mary was selected because of the closeness and affinity that the parish felt to Mary, the Mother of our Lord. They felt that it was the Theotokos who had guided them to the founding of this new home of God. The Church was appropriately blessed and formally dedicated by His Eminence, Archbishop Victor, the head of the Antiochian Archdiocese of Toledo. The first priest to serve the Divine Liturgy at St. Mary's was Fr. Mahfouz, in 1928. He was succeeded by Fr. Gabriel Barrow, who was endowed with a magnificent voice befitting his calling and service to the Lord. There are many now remaining in the parish who well remember Fr. Barrow. After several years, he was succeeded by the Right Reverend Hannanias Kassab, and later by the Right Reverend Basilios Abousaffie, and then by the Very Reverend Alexander Deebeh. Fr. Deebeh served the Church faithfully and devotedly for many years. St. Mary's was indeed blessed to have the pastoral service of such outstanding and devoted clergy. They guided St. Mary's Parish in the formative years and set us on a firm foundation. Throughout the early years of our parish, the Liturgy was celebrated almost entirely in the Arabic language. The early parishioners appreciated the use of Arabic at that time since it was their mother tongue. One evening, during the Easter season of 1945, an Orthodox Priest who had been ordained by the Russian Bishop, was visiting our Church. This young priest made an immediate, fine impression on the Parish of St. Mary's. His name was Father John vonHolzhausen. Soon thereafter he was asked to serve as assistant to Fr. Deebeh. His task was to institute the usage of English in the Liturgy and services of the parish. Immediately, more and more of the young people started to attend. Later, Fr. Deebeh was transferred and Fr. John became the Parish Priest. He was appointed and officially installed by His Eminence, Archbishop Samuel David. Fr. John was an individual who commanded authority and great respect. His new task was to guide our growing parish in its spiritual development. Not only did Fr. John serve the Church devotedly for more than a quarter of a century, but also his Khouria, Evelyn, dedicated her life to St. Mary's. She served in the capacity of Sunday School Superintendent. Her method of teaching, along with her excellent curriculum, soon became a model for the Toledo Archdiocese. The years following the Second World War saw continued growth at St. Mary's. It soon became apparent to the Board of Directors and parishioners that the building on Hudson Street was inadequate for the increasing number of churchgoers. The Parish was extremely fortunate once again in locating a suitable building, the Universalist Church at 8 Inman Street in Cambridge. Arrangements to purchase it were soon finalized. The move to Inman Street was a dramatic one. It meant a complete change from what had been familiar in Boston, and becoming oriented to the environs of Cambridge. The present Church was formally dedicated by their Eminences, Metropolitan Anthony Bashir and Archbishop Samuel David in 1954. At this service, the Church was filled to capacity by the many Orthodox Faithful of Boston and Cambridge, and various other towns and cities in the region. They came to witness this special event in the life of St. Mary's Parish. The building that St. Mary's purchased is an edifice of tremendous historic background. It contains, among other notable features, beautiful stained-glass windows which date back to the pre-Civil War era. These splendid windows, along with the beautifully curved oak pews, marvelous architecture, and wrought-iron balcony railings all make St. Mary's Church an outstanding monument of classic beauty. The iconostasis was transferred from Boston and installed in the Cambridge Church. The work was performed by diligent and faithful members of the Parish. They lovingly and devotedly worked to make many needed repairs. The result is a work of beauty and magnificence befitting the House of God. During the two decades since the move to Cambridge, the Parish has grown constantly. The various Boards of Directors and Parish Councils have directed the energies and ambitions, according to the Orthodox Faith, to extend the religious atmosphere of the Church. With the passing of time, the Parish suffered the loss of our beloved Khouria Evelyn on December 23, 1971. Fr. John never fully recovered from her death, and soon requested, because of his ill health, to be relieved of his duties as Parish Priest. Shortly before his retirement, Fr. John was elevated to Archimandrite. (Fr. John reposed on March 14, 1974.) He was the author of many religious texts, and was regarded as an authority in Byzantine music. He was respected in the academic world, as well. He lived to see some of his works printed, and others were published posthumously. His "The Catechism for the Young" was used throughout the Toledo Archdiocese for many years. 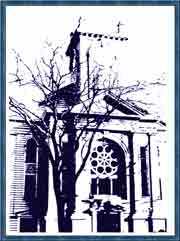 In December 1971, the pastorate of St. Mary's Church was entrusted to Fr. Nicholas Steele. Fr. Nick performed his work faithfully and devotedly. He loved the Church and worked constantly and diligently. Because of his expertise in the field of music, the Choir began to take on a greater degree of importance in the Liturgical services. Under his leadership, there was a renewal in the life of the Parish, resulting in the Church once again becoming an important part in the lives of the parish membership. All this soon came to an abrupt end, however, when Fr. Nick was taken ill. After a prolonged illness, he died. He is remembered as a young, energetic, and devoted Priest. The parish was greatly saddened by such a tragic loss. Following the death of Fr. Nick, we were guided by various supply-priests until Fr. Athanasius Emmert, later Archimandrite, became Pastor. Fr. Emmert was appointed to St. Mary's Church shortly after his arrival from Germany in September of 1974. He remained with the Parish one year before being transferred to Chicago. He was a soul-searching Priest. His prime interests included preaching the Word of God and the parishioners' spiritual growth. He was a strict shepherd, a guiding light to all those who wished to seriously look for spiritual guidance. He was greatly loved and tremendously admired. On September 1, 1976, Fr. David Buss was appointed to fill the position of Priest and Pastor. Upon his arrival from Portland, Oregon, he found many new adjustments to be made: becaming familiar with both New England and the various workings of the Parish. Shortly after his arrival, a serious illness in his family compelled Fr. David to return home to Oregon. After less than a year of service, he requested to be relieved of his duties at St. Mary's. His departure was met with great dismay and consternation because it seemed that the Parish was just beginning to become acquainted with him, and to learn of his background and his work of former years. It was equally with great reluctance that Fr. David took leave of St. Mary's. During the past decade (the 1970's), it has been the good fortune of St. Mary's Church to have the availability of Fr. Anthony Sakey, who, although semi-retired, filled in for the various Priests during their vacations and absences. The Church has been exceedingly blessed to have had his services whenever needed. Fr. Anthony has brought with him a world of experience based upon years of commitment to God and the Church. We are grateful for his labors. One of the most important events to occur in life of St. Mary's Parish took place on March 1, 1977, with the appointment of Fr. Demetri Khoury as our Pastor. He came to us from St. George's Church in Boston, where he had been an assistant priest for several years while attending Holy Cross Seminary. The presence of Fr. Demetri immediately began to have a positive effect. He was the inspiration for many new projects. Fr. Demetri is a living dynamo of activity and a compelling force. Since his arrival, St. Mary's Church has increased her sphere of influence in many areas. Fr. Demetri, among many of his projects, has organized and instituted the first library of St. Mary's Church. This has been the result of careful planning and dedication for the further enlightenment of the parishioners. Fr. Demetri has further developed the practice of inviting guest lecturers and speakers for many occasions. The Orthodox Youth Association has grown in its scope and effectiveness. The Sunday school has been functioning very successfully. The finest material is made available to each and every student. The learning process has developed into a very well regulated system. The early teachers at St. Mary's Church would be exceedingly proud of the advancement made by the Staff and the students at the present time. Their guiding principle has always been: The greatest reverence is due a child. Fr. Demetri has been extremely devoted to St. Mary's Church. He is a living symbol of dedication to his pastorate. The Parent-Teachers' Association and the Ladies' Society have consistently worked diligently and enthusiastically for the continued advancement of St. Mary's Church. The women have been truly heroic in their unending support. The Church Choir has energetically and faithfully carried out its duties. Over the years the Altar Boys have performed their duties with decorum and deep respect. The Parish Councils have always been dedicated to their responsibility of the Church: the furtherance of the Orthodox Faith. The year 1978 has seen the Golden Jubilee of the Church. The parishes of St. John of Damascus and St. George of Boston concelebrated our anniversary Liturgy. This historic event will be indelibly noted, since His Eminence, Metropolitan Philip Saliba, and Fr. Demetri, and very many other clergy took part in the Divine Service. The Golden Jubilee weekend came to a dramatic climax with the Grand Banquet held at the Chateau de Ville in Framingham. At this time, Fr. Demetri thanked all the members of the Parish for their tremendous cooperation in the many and varied enterprises of the Church. With great praise, His Eminence, Metropolitan Philip Saliba congratulated the parishioners of St. Mary's Church for the courage and stamina shown by the early founders, and exhorted them to continue the marvelous work of these stalwart individuals. The 1970's and 1980's witnessed growth, not only in numbers, but also in many more significant ways. The clergy brought to us an increased awareness of our responsibilities as Orthodox Christians. Fr. Nicholas Steele initiated the change to an English language choir, the first in a series of changes to encourage spiritual growth in the primarily English-speaking parish. Fr. Athanasios Emmert rekindled an awareness of our spiritual obligations. Fr. David Buss emphasized the importance of prayer, and started adult education classes. Fr. Demetri Khoury, our first priest in thirty years of Middle Eastern background, liturgically and organizationally gave us new goals, confidence, and sense of community with our sister parishes. After brief service from Frs. Paul O'Callahan and George Shaheen, St. Mary's was blessed by the arrival, in 1981, of Fr. Gregory Phelan as our shepherd. With his Khouria, Francine, and their children, he committed himself to us, his first parish. He had a demeanor that exuded faith. Believing that the Holy Spirit was watching over us, Fr. Gregory helped us to understand that anything is possible when we work together in His Name. We embarked on ambitious renovation and fundraising programs. After eight years with us, his pastorate was cut short by his untimely illness and death from cancer. He had brought us the spiritual practice of attending services held other than Sundays, and the desire to open our doors to all who wished to enter. No longer an ethnic parish, we came to realize our future was to bring Orthodox Christianity to others. Our current pastor, Fr. Alexis Kouri, Khouria Anna, and their two children have been an additional blessing bestowed on our parish. His love of music follows in the tradition of priests at St. Mary's. Khouria Anna's nursery school program is a wonderful addition to our Church School program. We pray that God will grant many years to them and the parishioners of St. Mary's Cambridge. In October 1998, St. Mary's Parish celebrated her 70th anniversary. Our former beloved priest, Fr. Demetri Khoury, had been elevated to the episcopacy in the Antiochian Archdiocese in March of 1995. We have been blessed by his continued visitations to our parish since his elevation. We were overjoyed by his episcopal presence at our 70th anniversary celebrations. His Grace, Bishop Demetri remains a strong and benevolent presence at St. Mary's. Since his episcopal duties are to oversee the parishes of the Midwest Region and his residence is in Toledo, we are, unfortunately, unable to have his presence among us as frequently as we would like. We are grateful, however, when his schedule allows him to be with us. In 1993 Fr. Antony Hughes became the Pastor of St. Mary's. Fr. Alexis had been called to serve a parish in Florida (which has since been blessed by the Holy Spirit in its growth and expansion under his pastorate). Fr. Antony and Khouria Carol, and their two sons, Alexander and Gregory, have been a blessing to St. Mary's. Following in the line of priests who were musically gifted, Fr. Antony's beautiful tenor voice enriches all of our services. His natural intellectual gifts have proven useful in spreading the Orthodox Faith to the surrounding campuses of MIT and Harvard. St. Mary's has become a truly integrated parish: the founding Arabic families continue to be active in the life and governance of our parish, but there are now numerous converts to Holy Orthodoxy from many backgrounds, both Protestant and Roman Catholic and non-Christian, as well as members from numerous other Orthodox jurisdictions. St. Mary's is also blessed to have become an important parish for the immigrant Eritrean and Ethiopian communities of Boston. The only sad thing that has come to pass over this last decade is the repose of so many of the original members of St. Mary's Parish. Fr. Antony, at one of these memorials, said that St. Mary's has been blessed over the years with many saints. This author, though a relative newcomer to this parish, wholeheartedly agrees with this observation. The intercessions of these "pillars" of our parish are now added to those of the Theotokos. Though we miss their physical presence among us, we have faith that their love and concern for the life of St. Mary's is just as strong and their dedication just as great as when they were building this parish with the sweat of their brows. There are so many people who are doing so many wonderful things for the sake of the life of St. Mary's Parish and the spread of the Kingdom of God, that it is not an exaggeration to say that one must read out the parish membership list to accurately count those involved in all of the good activities at St. Mary's. The past decade has seen a great blossoming of gifts and talents at St. Mary's. The future promises many more good deeds and much deeper spiritual maturity for our parish membership. Through the prayers of the Theotokos, and the grace of the Holy Spirit, we are confident that the members of St. Mary's will be further dedicated to serve our community and will prove to be a great blessing to those around us in Cambridge and beyond.